Welcome to the world’s most comprehensive, accurate, and up-to-date guide to Universal Orlando Resort’s Express Passes. There is a lot of information in this guide, including several FAQs at the very bottom. We highly recommend that you take the time to read through all of our information thoroughly, as we will likely answer every question you have – including whether Express Passes are worth it on any given date. What are Universal Express Passes? Universal Express Passes allow guests to skip the regular standby line – and use a special Express Pass line – at most of the attractions in Universal Studios Florida and Islands of Adventure. 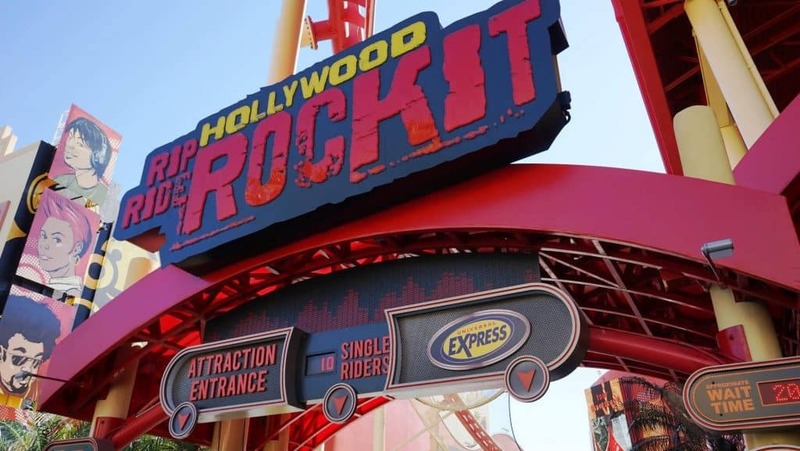 For example, let’s say the regular standby line for Hollywood Rip Ride Rockit is a 45-minute wait, which means the Express Pass line will likely get you on the ride in about five to 10 minutes. This brings to light our first important point: Express Passes are not “front of the line” tickets. When Universal Studios Florida and Islands of Adventure are busy, there will be a wait when using Express; however, that wait will be significantly shorter than the standby line, and you will practically never wait longer than 15 minutes. If the attraction is a ride, the Express Pass line is a separate, shorter queue than the standby line – with one important exception, which we’ll get to in just a moment. If the attraction is a show, guests with Express Passes are allowed into the venue before everyone else, granting them better seats. However, to take advantage of this, you must be in the Express queue before the audience is admitted into the theater (usually 10 to 15 minutes before the show); once both the Express Pass and standby lines have been let in, your Express benefit is forfeited for that performance. So, what’s that important exception for Express-enabled rides? Starting in 2017, Universal began to install a brand-new feature called Virtual Line at some of its just-opening attractions. In these instances, guests will need to wait virtually in the line (hence the name) instead of doing so physically; this is accomplished by either checking in with the official Universal Orlando app or by registering with a kiosk outside of the ride in question. As you might guess, Express access works a bit differently at these attractions – your Express Pass will enable you to walk right onto the ride without having to fuss with the Virtual Line component at all. What about Universal Express at Volcano Bay? Express Passes at Volcano Bay, Universal’s water park, operate the same exact way as they do for the theme parks’ Virtual Line rides – that is to say, they allow you to walk right onto any water slide without first having to virtually register. There is still some important fine print to read through, however (including the fact that there are actually two different tiers of Express available at the park), so we suggest you see our complete guide to Volcano Bay’s tickets and study up. Which attractions offer Universal Express access? *** Despicable Me: Minion Mayhem is the only attraction whose Express Pass line routinely has a wait longer than 15 minutes – in fact, because of the ride’s small capacity, Despicable Me’s Express wait time can be as high as half of the posted standby wait time. Note: remember how we said Volcano Bay’s Express Passes were broken up into two different levels? They are basic, which covers only a handful of attractions at the water park, and Plus, which includes all of them. Do I have to pay for Express Passes? With a few exceptions, Universal’s Express Passes must be purchased. We’ll discuss pricing in a bit; for the moment, what you need to know is that you will most likely have to pay for them one way or another, and that an Express Pass is separate from an admission ticket. So, yes, if you want to go into the park and enjoy Express access, you will need to purchase two separate tickets – again, with a few exceptions, which we will address now. Are there different types of Express Passes? There are, indeed, several various types of Express Passes (beyond those at use at Volcano Bay, that is), and there is a variety of ways to get them. We’ll go over these now. The basic Universal Express sold as a standalone ticket allows a guest Express access one time at each participating attraction, similar to how you can only use Disney’s FastPasses once per reservation. If you want to ride anything again, you will need to use the standby line. Universal Express Unlimited is a second standalone ticket option that offers unlimited Express access at each participating ride. If you purchase one of these, you get to ride and re-ride the participating attractions, and visit the shows, as many times as you would like throughout the day using Express access. Express Passes sold as a standalone ticket are good for one day only, and each member of your party needs his or her own ticket, even kids (three years or older). This means, of course, that if you are going to Universal’s theme parks for multiple days and you want Express access for each of those days, you will need to purchase multiple Express Passes. Likewise, if you have multiple guests in your party and you want all those individuals to have Express access, you need to purchase one pass for each person. Express Passes are sold in both one-park and both-park varieties. This is exactly what it sounds like – the one-park option grants you Express access for either Universal Studios Florida or Islands of Adventure (you choose which), while the two-park variation enables Express access at both theme parks. Needless to say, the former will save you a little bit of money, should you only plan on going to one park for the day. Guests can purchase Universal Express Passes as a standalone ticket online, over the phone (407-224-7840), at the theme-park gates, and throughout all three parks at dozens of locations (at Volcano Bay, for instance, your options include Guest Services and the three concierge huts). Please be aware that Express Passes are not available from third-party vendors. Also, there is no such thing as a “discount” Express Pass sold as a standalone ticket; for planning purposes, they’re the same price everywhere and for everyone. In addition to being able to buy Express Passes as a standalone ticket, Universal also sells what it now refers to as a PARK-TO-PARK TICKET + UNIVERSAL EXPRESS UNLIMITED. Guests who have been traveling to Universal for a while will remember these as “VIP Tickets” (not to be confused with Universal’s VIP Tours, of course). As indicated by its newer name, a PARK-TO-PARK TICKET + UNIVERSAL EXPRESS UNLIMITED is park admission and unlimited Express access bundled into one ticket. These tickets are available in one- and multi-day varieties; admission and unlimited Express access are included for however many days you choose. Please note that a PARK-TO-PARK TICKET + UNIVERSAL EXPRESS UNLIMITED is date-specific – you’ll have to select which days you are going to use it during the purchasing process. However, you do not have to use your days consecutively; like standard admission tickets, once your pass is first used, you have a 14-day window to use any remaining days on it. PARK-TO-PARK TICKET + UNIVERSAL EXPRESS UNLIMITED must be purchased through Universal, either online or over the phone (407-224-7840). What if the price of a multi-day option changes over my travel dates? Universal has told us that the date you select when purchasing a PARK-TO-PARK TICKET + UNIVERSAL EXPRESS UNLIMITED should correspond with the very first date you use the ticket at the parks, regardless of whether the price fluctuates on subsequent dates. As you see in these examples, yes, the savings do add up significantly if you are planning to visit multiple days. Keep in mind that the prices quoted above do not include tax, aren’t reflective of Universal’s current pricing levels (though the math behind them still holds up), and, as always, are subject to change until the dates pass. Be sure to do your own math diligently before making a final purchasing decision. ** For the purposes of this calculation, the Express Pass prices on December 12, 13, 14, and 15 were used. However, remember that you are not required to use the PARK-TO-PARK TICKET + UNIVERSAL EXPRESS UNLIMITED option on consecutive days, as we noted earlier. It’s true: if you stay at one of Universal’s three premier on-site hotels – Portofino Bay Hotel, Hard Rock Hotel, and Royal Pacific Resort – you will receive complimentary unlimited Express access each day of your visit, including your check-in and check-out dates. 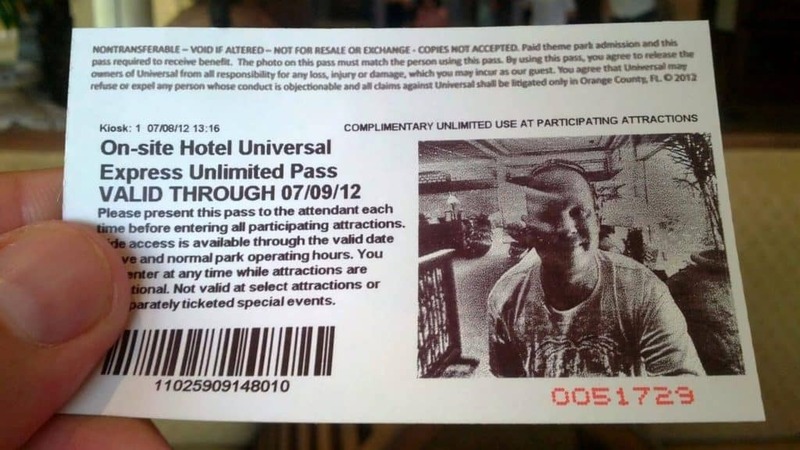 It used to be that Universal employed a photo Express Pass procedure for on-site guests – in which users would step up to a kiosk to get their picture taken and have a special card printed out – but now the hotels have reverted back to their original practice of simply having their room keys double as Express Passes. HUGE REMINDER: the Express Passes offered at Universal Orlando’s three premier on-site hotels do not cover Volcano Bay or separately-ticketed events, such as Halloween Horror Nights and Rock the Universe. Each of these have their own Express Passes, and, even if you are staying on-site, you will need to purchase them if you want Express access at the water park or during a particular event. LARGEST REMINDER EVER: if you’d like to stay at a hotel that offers Express access, make sure you select the right venue! Universal’s newer resorts, Cabana Bay Beach Resort, Sapphire Falls Resort, Aventura Hotel, and Endless Summer Resort, don’t feature the Express perk – but, then again, that’s precisely the reason why they feature rack rates that can be as much as 50% lower than their top-tier on-site counterparts. Don’t let this Express-less fact turn you off from staying at the new hotels, however. Simply use the cash you’re saving by booking at Cabana Bay instead of Hard Rock and put that toward the purchase of a PARK-TO-PARK TICKET + UNIVERSAL EXPRESS UNLIMITED, which we explained in detail above. If you do so, the net result can be the same as though you were staying at one of the three properties that do offer Express. Are Universal Express Passes worth it? We finally arrive at the biggest question of them all: is an Express Pass a good value? We’ll do our best to guide you to a decision. Express Passes are all about cutting down your wait time in lines or getting better seats at the shows; they do not open up any part of the theme parks that isn’t available to everyone else. So, the real questions to answer are: (1) how much time do you have, and (2) how much patience do you have for waiting in lines? During Universal’s busiest periods of the year, the average wait time at the popular attractions (like The Incredible Hulk Coaster) can climb to 90 minutes, while the headlining rides (like Despicable Me: Minion Mayhem) can have waits over 120 minutes. Even the wait times for less popular attractions can be 45 minutes or more. (See our FREE 12-month Universal crowd calendar and our ride wait times based on crowd levels pages for more detailed information.) In this case, an Express Pass can help tremendously. Even though you may not need Express access, think how much more enjoyable your day at the park will be when you can spend your time exploring and having fun and not waiting in lines. Furthermore, if you are trying to see both Universal theme parks in one day during busy times, you simply will not be able to see and do everything – without great discomfort to yourself and others in your party – unless you have Express Passes. However, there are two more points to consider. First, although the major attractions in The Wizarding World of Harry Potter do now support Express Passes, if it’s really busy a queue system may be in use to get into either Hogsmeade or Diagon Alley in the first place – and Express won’t help to bypass that system. Second, the longest wait times usually occur during the middle of the day, from 11:00 am to 3:00 pm. If you can visit either before or after then, you will experience shorter wait times. When Universal Studios Florida and Islands of Adventure are slower, Express Passes become much more of a convenience and not at all a necessity; with the possible exception of Despicable Me: Minion Mayhem, it’s unlikely to find wait times longer than 30 minutes. What’s more, Express Passes never sell out when the park crowd levels are this low. That means if you decide you want Express Passes, after all, you will have no problem buying them inside the theme parks. What we tell people is wait until you get there, see what the lines (and your mood!) are like, and then decide. Remember, you can also upgrade your existing admission ticket to the PARK-TO-PARK TICKET + UNIVERSAL EXPRESS UNLIMITED option at Guest Services. So, if you’ve made it on-site, observed the crowds, and crunched the numbers, and now you see that the bundled ticket is a better value than you first anticipated, head on over to Guest Services. We’ve covered a lot already, but there’s still so much more to discuss! We’ve gathered the biggest questions you may still have about Universal’s Express Passes and collected them together for you below. Do Express Passes have return times? Quick tip: if you have a basic Express Pass, which means you can only use it once per attraction, it’s best to save it for when there is a line longer than 15 minutes – if the wait is shorter than that, you might as well jump into the standby line. How much do Express Passes cost? 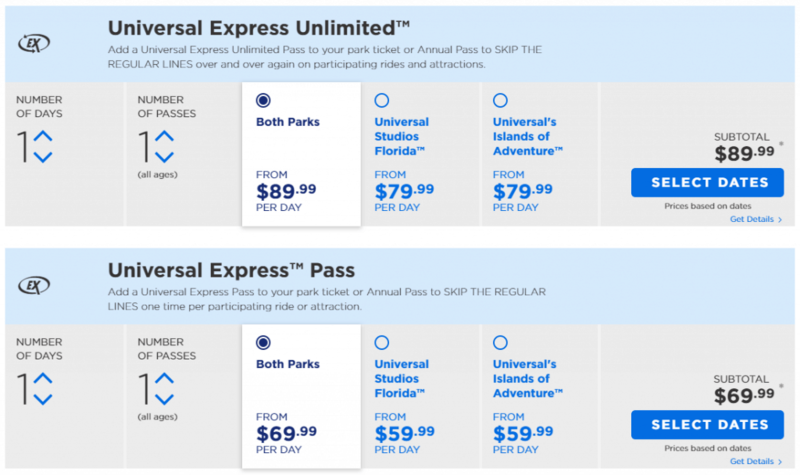 Just like how hotels adjust room rates and airlines modify plane tickets based on demand, Universal also tweaks the price of its standalone Express Passes based on anticipated park attendance. 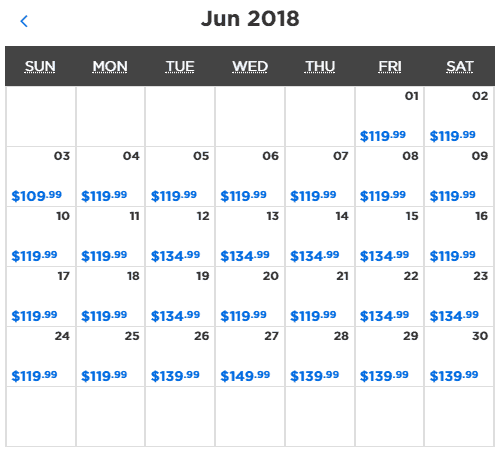 As a result, the prices for the theme parks’ Express Passes fluctuate throughout each day of the year, from $49 to as much as $169 per person; Volcano Bay’s Express pricing, meanwhile, starts at $19 for basic and $39 for Plus. Express Pass pricing is also not set in stone. If you look today, the price for a particular day may be $59; tomorrow, it’s possible that the price will go up (if Universal sees that it’s selling more than it expected), or it may go down (if it’s not selling enough at the current price point). As a general rule of thumb, you can expect Express Pass pricing to go up for busy dates, like the last week in December, as those periods approach – meaning that, if you have decided that you are for sure going to buy them, do so as soon as possible. Please note again that Express Passes are the same price for everyone, regardless of age; there are no child discounts for Express Passes like there are for regular admission tickets. In fact, Express Passes are essentially never discounted in any way for anyone – sometimes, you will be able to find “discount” admission tickets, but you will never find discount Express Passes. And, as we mentioned above, Express is only available for purchase directly from Universal. Do Express Passes sell out? Although rare, Express Passes can potentially sell out, typically during Universal’s busiest times, like the last week in December. That’s why, if you are going in a peak busy season, you should buy your Express Passes now (noting, of course, that they are non-refundable). Pro tip: standalone Express Passes can be purchased by themselves – you do not need to buy general park admission to get Express, or vice versa. So if you are still not quite sure where you are going to buy your admission from but know right now that you want Express Passes, you can go ahead and buy them. What’s the deal with Express Pass Plus? This is a bit of a history lesson. When Universal Orlando first opened, it did not offer Express Passes – the idea of paid Express access was a concept added later on. When Universal eventually introduced Express Passes, each one only included quick access to a small group of attractions in a certain area – say, the New York backlot of Universal Studios Florida. If you also wanted quick access to attractions in a different area, you had to purchase a different Express Pass. As the program became more popular, Universal introduced Express Pass Plus, an enhanced ticket that allowed guests Express access to all the attractions throughout the entire theme park in question. Nowadays, there are no more “non-Plus” Express Passes that are limited to only a certain area within one of the theme parks – in this sense, every Express Pass that is sold today is an Express Pass Plus. That is why you may see the word “Plus” as part of some of Universal’s older advertising but no option to buy a “non-Plus” version (unless, of course, we’re talking about Express Pass Plus for Volcano Bay, which only serves to muddy the waters a bit more). If I use an Express Pass, will I be able to sit in the front row on the rides? Theme-park veterans know that many thrill rides already have two queues: one for guests who want to sit in the front row, and one for those who want to get on the ride as fast as possible and are happy to sit anywhere. Since the front-row line usually starts about 20 feet before the main loading area, the question here is, if you are already in a separate queue because you’re using your Express Pass, will you be able to also get in the front-row line? It turns out that only one of Universal’s rides has a separate front-row queue – Incredible Hulk – and since its Express line merges with the standby one before you reach the main loading area, you’ll be able to use your Express Pass and still choose to get in line for the front row. Can I jump from the regular queue over to the Express queue after I get past the guy with the scanner? Obviously, this is against Universal policy and will get you kicked out of the park, so we wouldn’t advise trying it in the first place. But if you are thinking about it, be aware that Universal generally sets up two scan points for Express: one at the very front of the attraction, where you first enter, and a second midway through the Express queue. The second scan point is chosen strategically, and it is usually placed at a location where guests can no longer physically get from one line to the other or after the two lines merge. If I use the Express Pass queue, will I miss out on the storyline or theming? If I use the Express Pass queue, will I miss out on the in-queue photo ops? There are only two attractions that feature both an in-queue photo op and Express access, and those are The Amazing Adventures of Spider-Man and Escape from Gringotts. And, yes, if you use your Express Pass, you’ll be missing out. Can you tell me again how Express Passes work for shows? All the big shows at Universal Orlando have a separate queue for folks with Express Pass access – quite similar to the rides. When the doors open for show seating, the Express Pass line gets first shot at the seats, and then everyone else is let in. The key to successfully using Express for shows is to keep in mind that an Express Pass won’t help once the standby queue has been let into the theater. So, if you get there only five minutes before show time and they have already let in the Express Pass and the standby lines, you will get whatever seats you get — regardless of whether you have Express access or not. If you visit on a crowded day, we’d recommend that you get to the shows about 20 to 30 minutes before they are scheduled to begin. If you visit when it is slower, cut that down to 10 or 20 minutes. Can I share my Express Pass with another guest? To start back at the beginning, it’s important to understand that all admission tickets, annual passes, and Express Passes sold at Universal Orlando are non-transferable (which is a very common practice for theme parks). This means you cannot legally sell or otherwise give the ownership of your ticket to another person. This most commonly is a problem when people unwittingly buy partially-used “discount” admission tickets – they bring their used tickets to the turnstiles, and even though the tickets may have days left on them, the guests can’t get in because they’re using someone else’s passes. As a lot of folks know, theme parks monitor this by requiring guests to have a biometric scan of their thumb or index finger taken, which is linked to each guest’s ticket in the park’s computer system. But what about Express Passes? Just remember that this is against policy, so if you want to try to share Express Passes, you do so at your own risk. We’re not encouraging it – indeed, we’re encouraging you not to do it because you might lose your Express Passes or, even, be banned from the resort. We should also note that, while guests don’t have to scan their fingers when they enter the Express lines, the passes themselves are usually scanned. This means if you have a basic Express Pass, plan on only being able to use it one time per participating attraction.